On 1st-3rd march 2017 Maria B lunched her latest and unique summer collection 2017 for ladies. Maria. 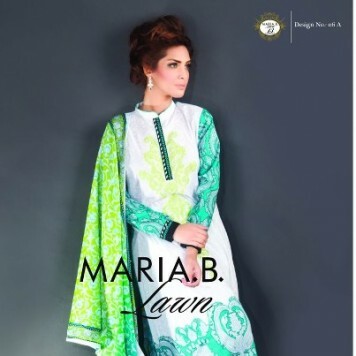 B is big name in the Pakistani designer clothing , Maria is known for her bridal collection named as “Maria B Brides”. From last eight years she is known for her unique and creative Pakistani dresses for women and girls. Mria’s product range include party wear, evening wear, bridal collection, jewellary, winter collection, spring summer collection, accessories, Mari B collection for girls casuals and cottons. In Pakistan summer season is very hot with high temprature and it is very difficult to look best in such hot weather conditions, to look gorgeous in summers see best summer make up tips. This lawn collection includes emriidered lawn suits that are according to the requirements of Pakistani ladies. The prices for unstiched lawn dresses ranges from 3690-4750 Rs. You can see Maria B lawn collection 2017 below, pictures are taken from catalog. To purchase these dresses you can visit her official site and go to any of her store located in major cities of Pakistan and USA.